It’s that time of year when the British summer peeps go crazy for festival fun. 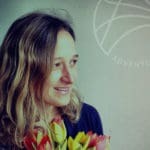 It is important to look after oneself in this time of party madness and this is why festivals have amazing healing areas, where you can go and release tension from dancing or walking around lots with massage treatments of all descriptions and yoga classes to energise and revitalise weary, aching bodies. Here I will let you into some yoga secrets of how to cure hangovers from hell, either during or post festival fun. Most importantly, before embarking on a yoga class or practice, remember to drink plenty of water before and after especially if you have been having a very good time the night before! 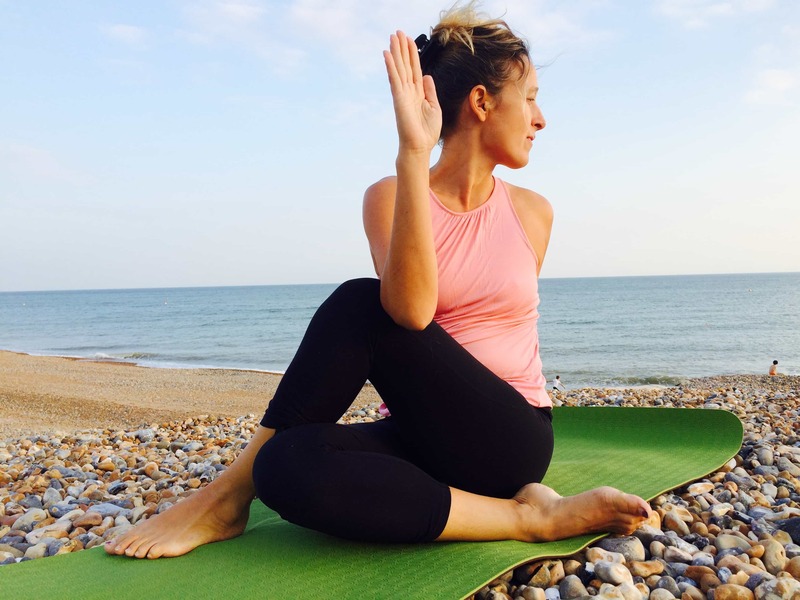 And if you are saving your practice for after the festival, try these postures to help squeeze out the toxins and increase blood flow around the body which also aids the breakdown of toxins in your system too. Firstly, warm up with a couple of gentle sun salutations. This warms up the whole body, increasing blood flow and preparing the body for the postures you are about to do. In yoga, twists are known as the best detoxing asana (postures). The reason why is that they have a wringing effect on the internal organs. Twisting the torso to one side compresses the internal organs of the side that you are twisting to, massaging the internal organs, whilst the effect on the opposite side is stretching, lengthening and toning of the internal organs and muscles fibres. Both processes also stimulate blood flow to the areas, encouraging the build up of toxins to move around the body and eventually be removed. Sitting on the floor with your legs stretched out in front of you, bend the right leg towards your chest, foot flat on the floor, back remaining straight. Inhale, lift up the right arm and twisting to your right, place the right arm behind your left buttock. On the next inhalation, lift up the left arm, making space between the ribcage and the pelvis, and twist to the right, placing the outside of the left upper arm on the outside of the right thigh, using this position to act as a lever by pushing the upper arm on the thigh, to twist the torso more to the right. Keep the shoulders away from the ears and on every inhale, lengthen the body and on the exhale, twist more to the right. Stay for 5 breaths and then on the exhale, gently unravel the way you went into the posture. Headstands are also great for helping to remove the headache side effect that alcohol brings on and energise body and mind. Don’t be put off when I say this! You don’t have to do the full posture to reap the benefits of the headstand. In yoga, a headstand is called an “Inversion” posture, which means going upside down, like shoulder stand or bridge. 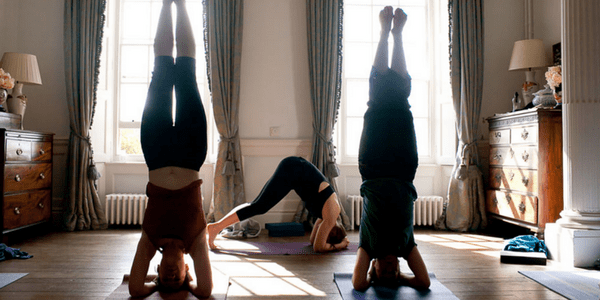 If headstand is too advanced for you, then break it down into stages. 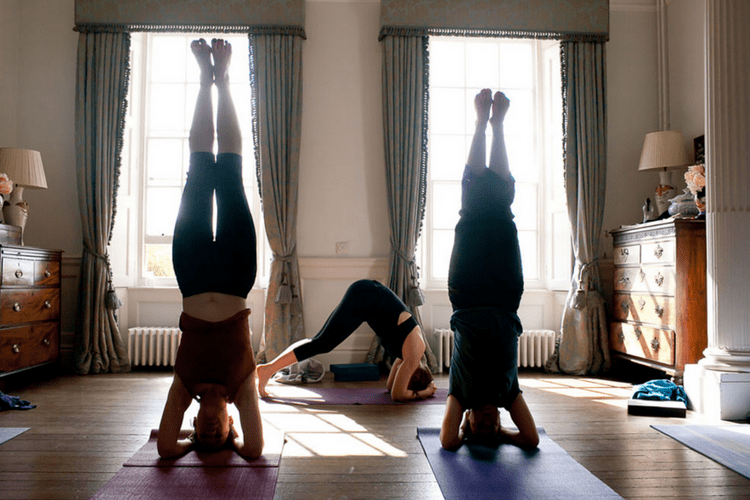 Just allowing yourself to be upside down is an energising and revitalising position to be in. These stages will be described below. Headstand is beneficial because the pressure that builds up from the hangover is relieved by resting the forehead on the floor. It is also nice, in the initial variations of headstand to place a wet flannel on the ground and rest the forehead on this. It is energising to be upside down because it gives the circulatory system a break. Blood flow to the brain is easier than usual for the heart and brings a greater quantity of oxygenated blood to the brain, bringing along with its energy and cleansing. Always start in child’s pose, resting the forehead on the floor arms by your side. This helps to prepare the body for the inversion by allowing the blood flow to start moving more so into the head. Then sit up, Hands holding onto the elbows and lean forward and place your forearms on the ground whilst keeping hold of the elbows. Release the grasp at the elbows, bring your hands in front of you and interlace the fingers. Place the little fingers and the outer edge of the hand on the floor. Place the crown of your head in your palms. Keep length in your neck so that your shoulders don’t fall around your ears. Either stay with back curved and knees on the ground as in child pose or straighten your knees and bring your hips into the air. Stay here if this is as far as you feel you can go. These 2 beginner variations are enough and if you are a competent yogi then go into a full headstand. Backbends also massage the internal organs by placing pressure on them whilst lying on the abdomen. Backbends also stretch the internal organs and muscles of the abdominal region, stimulating circulation and therefore detoxification. Bow Pose (Dhanurasana) is a favourite of mine. The hands clasping the ankles helps to open the chest, stretches out the hip flexors and creates a natural rocking motion to happen on the abdomen, which, like the twist has a massaging effect on the internal organs. Lying on your abdomen, chin resting on the floor, bend the legs so your feet are raised to the ceiling. Next, keeping your chin on the floor, reach behind you with your arms and hook your hands around the outside of your ankles. Press your pelvis into the floor, lengthening the lower back. Squeeze the shoulder blades together, opening the chest and lift the head and chest off the floor. Press the ankles into the palms of your hands, allowing more lift in the chest and lift the thighs off the floor. With each inhalation, lift the crown of the head and press the chest forward whilst pressing into the hands to stretch out the thighs. Gradually on the exhalation lower the body slowly to the beginning posture and rest for a couple of breaths. Liver help for festival fun! So it’s that time of year again, the sun (tries) to come out and British culture goes mad for camping, glamping and dancing around in muddy (or hopefully not) fields embracing the great outdoors and going “back to nature”. Within all of this fun, sometimes our health is neglected and we come home with our tails between our legs, experiencing pain which we first think is back pain, however, it is, in fact, your kidneys crying out for some love. A few natural remedies to set you up and support your liver and kidneys can be taken as a warm up to all of this fun and post-fun to help keep your energy and spirits high. A splendid herb that acts as a “liver tonic” is Milk Thistle. The most active ingredient is silymarin which contains both anti-inflammatory and antioxidant properties. The silymarin present helps to stimulate the growth of new liver cells and can prevent certain toxins getting inside the liver by altering the outer layer of it. The seeds of milk thistle protect the liver from various toxins such as alcohol, pollution and all kinds of medications. Modern research has proved that the medicinal effect of this herb contains a detoxifying agent which is helpful in curing all kinds of liver ailment. So get prepared for your summer of fun and make your friends wonder why you feel so great after a party!